Growing up I would ask my parents to get a pool every summer. Every summer they would say no. To be honest I asked them to get a pool this summer too; still no. Sigh. I guess it’s a turtle shaped kiddie pool for me again this year. Instead of a pool they have trees and gardens. Sitting in the backyard almost makes me forget that I’m in a city. There are two little herb gardens, tomato plants, cucumbers, peppers, all kinds of flowers and more. Birds and squirrels are regular visitors. This weekend some raccoons also stopped by. They showed up in the middle of the afternoon, and didn’t seem to be afraid of people at all. One them came right up to the patio door knocked. He would have come and sit down to lunch if we had opened the door. They are strangely cute and terrifying at the same time. They knocked over some plants, pulled my laundry off the rack. I assume they must have been very hungry because as far as I know raccoons are nocturnal, and although I felt bad I couldn’t feed them. I wanted my backyard back. My dad eventually scared them off, and we were once again able to enjoy the day. 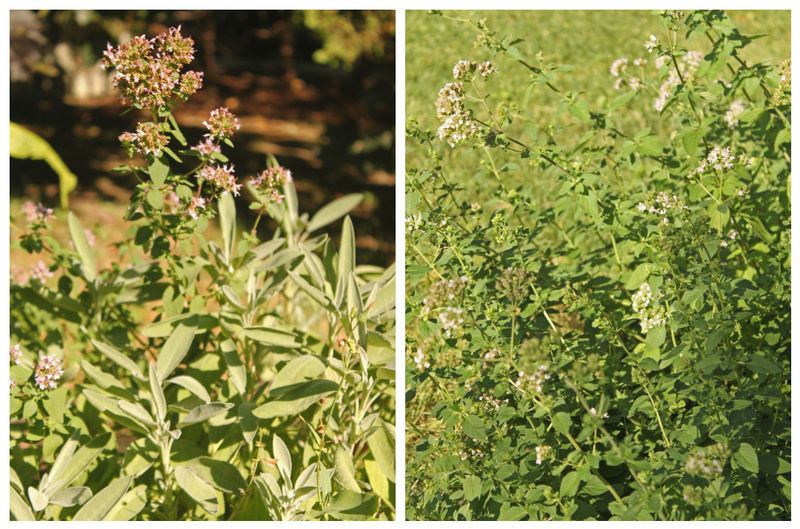 Along with the sage and oregano in the picture above, there is also sorrel in the garden. I had never tried sorrel until yesterday; it’s got a zesty almost lemony taste to it. I instantly wanted to make a salad with it. I had already been planning to make a salad with cherries and decided to use the sorrel as well as some baby spinach as greens. The sweetness of the cherries was a great contrast to the zesty favour of the sorrel. In a small jar, mix the olive oil, lemon juice, tarragon, salt and pepper together. Put the greens and cherries in a large bowl. Toss with the dressing. Plate then top with the goat cheese and hazelnuts. Lovely back yard and wonderful recipe. I think I need to try this one out. I think the backyard sounds much better than a pool. Sorrel is something I have yet to try and your salad looks amazing-thanks for the inspiration to start trying new greens! 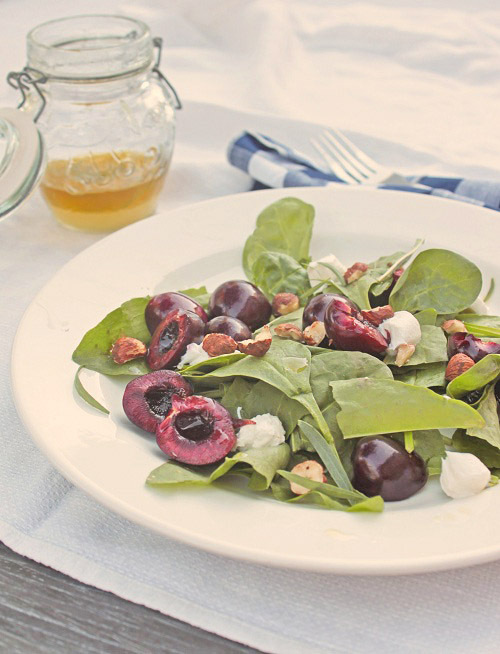 I don’t think I’ve ever knowingly tried sorrel either, but this salad sounds wonderful. And you described racoons perfectly…cute but terrifying at the same time! My first thought was ‘awww, raccoons’, but I’d probably retreat indoors too. Pulling your washing off the rack? Now that’s just rude! Love the salad. I’ve never tried sorrel before. I must do that. I haven’t tried sorrel yet, but hope to find some soon. Lovely salad! Thats an amazing looking salad! I’ve been absolutely obsessed with cherries this summer, so I love the idea of this salad. 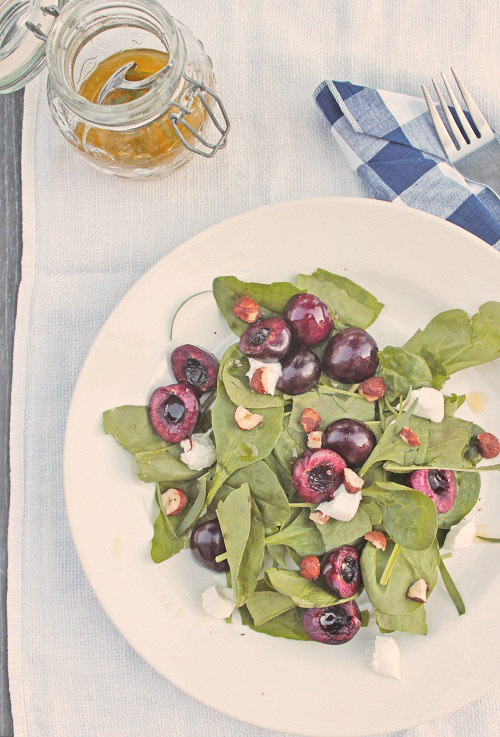 The combo of cherries and goat cheese sounds great. Great idea! I am also loving the cherries this month. Your yard looks lovely without a pool. And, how can you go wrong sitting outside enjoying this salad. Fantastic! The salad sounds incredible. And your photos – the top and bottom one, especially – are stunning.